Holthar is located on the northwestern portion of Sobukand. Most of this territory is covered by the Great Forest. As one moves to the east near Teyen, the forest thins out to a piedmont region. The Micelburn River empties into the ocean near the city of Sefasten and runs the length of this region, dividing it. The land is also divided further to the east by the Dunbar Mountain range. The Bei Shui River forms the boundary between Holthar and Teyen. The climate of Holthar is very warm for most of the region, although it does occasionally snow in the Dunbar Mountains. All of the cities and many of the towns boast schools and universities of learning. This people of Holthar value knowledge and engineering as much as they do agriculture. Stories are passed down from generation to generation of a great fire in Holthar. It is uncertain exactly how the fire began, some say it was a careless hunter from the South, some say it was from a lightning strike, and others say that it was an act of arson. Whatever the case, over two thirds of the forest burned, leaving people and animals dead and homeless. Even though evidence of the Great Fire can no longer be seen, there are stories about the great rebuilding efforts that took place afterwards. Some scholars claim that the spirits were damaged as well. To this day, those that have an affinity for fire spirits are few and far between. Historically, Holthar was the commanding force in Northern Sobukand and had a consistent, but loose, alliance with Teyen. The Kings of Holthar wanted access to the metals and wealth of the southern mountain range but did not want to trade their superior wool or gems in return. This attitude was one of the driving forces behind the Kings Wars. There were numerous attempts at treaties and peace talks. It was at one of these meetings that Princess Landra played with the daughter of King Albrecht Lovantra of Sorjund, Princess Helene. The two girls had a wonderful few days of fun, until their fathers separated them. The two princesses kept in contact using circumspect messengers and codes of their own devising and it is said that their friendship was the beginning of the unification of Sobukand into the Empire under them as the Empresses. Because Princess Landra became one of the Empresses, Holthar was seamlessly enfolded into the Empire. Although Landra’s brothers protested at first, they did not have enough resources or the desire to fight their sister. Each of the brothers remained leaders in their respective cities until they died of old age. Over all, most of the people in Holthar were tired of fighting and saw the unification under the Empire as a blessing. 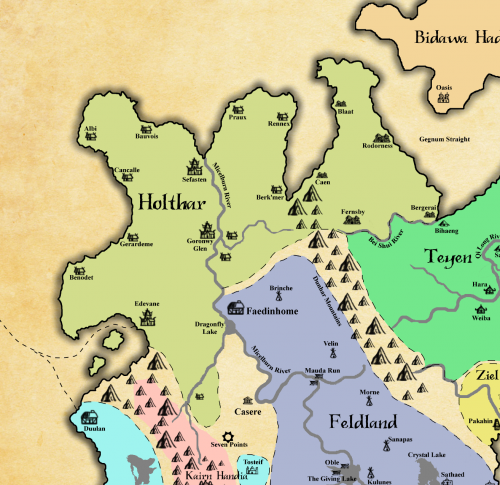 The major cities of Holthar are: Sefasten, Rodorness, Fernsby, Goronwy Glen, and Edevane. Edevane is a coastal city with a castle style keep, surrounded by the city proper which is surrounded by a wall. The Downlands is the area between the port and the city. The Downlands is generally seen as an unsavory collection of villages that lead up to the city walls. Although there is a port at sea level, much of this area is rocky terrain. It is believe that this part of the continent may have once been the foothills of an extension of the Sorfjell mountain range but that both the sea and the wind conspired to erode the terrain to what exists today. Because rocky terrain does not lend itself to farming, Edevane relies on the ocean for most of the foods and is known for having some of the best seafood in the north. The inhabitants also raise sheep and goats. Vegetables and fruits are transported in from Goronwy Glen. There are a few hearty scrub bushes and plants that help supply herbs for flavoring. Seaweed is a popular addition to many of Edevane’s local dishes. Although the city of Sefasten is close to the coast, it does not have an ocean port. There are some small towns along the coast; but the heavy forest of this area makes it difficult to have a large port city. Instead, there is a port along the Micelburn river. Goods are moved from large ocean faring ships to barges which make their way up the river to this port. The barges are also used for trading further up the river as far as Goronwy Glen. While the wooded terrain is not great for farming, the forest does provide a plethora of flora that is used in everything from cooking to rituals. Fruit trees are plentiful and there are certain mushrooms and spices that only grow near to Sefasten. Game hunting is the main source of animal resources. Local game includes deer, boar, quail, rabbit, squirrel, and occasionally bear. Furs and leather goods are often sold along the river from Sefasten. Rodorness lies along the North East coast of the piedmont. This is the only place along the eastern coast of the piedmont peninsula which has a harbor. However, because the water currents of the Gegnum Straight are deadly during the winter months, goods are often shipped to Blaat, offloaded by longboat and transported across to Rodorness by land. During the summer months, fishing is the main source of food for Rodorness. In the winter months, people rely on goats and small herd animals for food. There is some farmland; but only the hardiest plants will grow, although the weather is fine, the soil tends to be rocky. Rodorness gets the majority of its wealth from the mining of gemstones. Fernsby is in the south eastern part of the piedmont. It is bordered by the Dunbar Mountain range to the west and the Bei Shui River to the south east. This city is known as the City of Perfection by its inhabitants because it has a temperate climate, excellent access to freshwater, and wonderful grazing and farmland. Sheep and goats are common along with a few small herds of cattle. Fernsby established a close trade friendship with Teyen. One of the main trade goods that comes in to Fernsby from Teyen is silk. That silk combined with the wool from Fernsby’s sheep makes some of the finest fabric in all of Sobukand. Along with fabric and yarns, Fernsby is also known for producing fine cheeses. But the star export from Fernsby is coffee. Coffee beans are grown in the foothills of the Dunbar Mountains and are processed to make the wildly popular drink known across Sobukand. Holthar’s main exports are fabric, coffee, wood, books, paper, leather goods, dried fruits and wine. Goods make their way up the Micelburn River via barges and locks which help move against the flow of the river. Goods from Feldland are sent in a similar fashion down river toward Sefasten. The forest areas provide and abundance of meats, fruits and root vegetables. Coastal regions have the fruits of the sea (fish, crabs, lobster, clams and oysters) along with some limited hearty vegetables. In the piedmont area vineyards and orchards are abundant as well as herd animals such as sheep and goats. Cheese is one of the favorite offerings of this area. Finally, coffee from the foothills of the Dunbar Mountains rounds out the offerings of Holthar. While the greater part of Holthar is covered in forest, the areas near the rivers afford some farmland; they are mostly family farms and not as a major regional source of food. Hand pies or pasties are popular in this region as they are small and easy to carry from place to place. Fillings range from fruit to meat to cheese. Since a large part of the population lives and hunts in the forest, small musical instruments are favored in Holthar. Flutes, fiddles or violins, lutes and smaller guitars, hand pipes, and hand drums are popular. Really any instrument that is compact and travels well can be found here. Being of a warmer climate, most of the clothing of Holthar is made from silk, cotton or linen. All of these fabrics are things which are bought with the trade of the superior wool produced in the piedmont areas near the Bei Shui River. Depending on profession and location, women can be seen wearing anything from long light skirts, trousers and boots, or flowing light dresses. Fabric colors preferred by commoners tend toward greens, subtle blues and browns (all the better for camouflage in nature). Near the cities and larger towns, a riot of color is embraced, and clothing tends to be more formal. Women wear dresses with stays or corsets and bustled skirts. Men wear long sleeve shirts, fitted trousers and tailored suit jackets (OOG note: think Colonial or 1800 style European clothing). Kilts are also found to be stylish and practical, depending on profession. Menfolk generally tend to wear darker colors than the women folk. Even though the weather is warm and even hot, women rarely expose their legs. Bare arms are acceptable for both women and men to a point. Hats are common outside of the forest. From the days of the Kings Wars, the Holthar’s colors remain Green and Gold, so town guards, city guards, government officials, dignitaries, and any other official (mayor, lord, constable, etc.) sport these colors along with whatever symbol reflects their station and location along with the white, black, and red of the Empire. Each of the major cities has at least one university where students may pursue courses of study in a variety of trades and skilled labors. Spiritual studies and rituals are also taught at the universities. Towns and smaller cities will have schools that teach basic reading, writing and arithmetic. The larger cities have a relatively high technological development. Some of the guards use handguns, but swords or axes are preferred as they do not require reloading for use. There are printing presses, newspapers and books in all of the major cities. Horse drawn carriages are popular in the cities, but are rare in the more rural areas. Generally the surnames of Holthar’s people derive from two different mechanisms. Either there is a family name that follows a patriarchal lineage (Jeff Wheeler had children: Sue Wheeler, Jim Wheeler, Austin Wheeler . . . when Sue marries, she takes her husband’s last name) or the children’s names are given a suffix of son or dotter with the prefix being that of the eldest parent’s first name (Sarah is older than Tom, they have a son and name him Jason Sarason. All the children have the last name of Sarason or Sarasdotter). The second way makes tracing lineage much more difficult. The latter practice is not as common as it once was but some of the smaller towns still cling to the old ways. The Great Fire had a huge impact on the life of the people of Holthar. It is tradition to brush off your shoulders before entering a person’s home. This is said to have stemmed from people brushing the ash off of their shoulders before entering a home. Some people say it is ‘brushing the evil or negative’ off of one’s shoulders. This practice has been going on for so long that most people do it without even thinking about it. It is also customary to bring water or a drink of some kind along when going to someone’s home. Most of the people of Holthar carry a flask or small bottle with them and offer a sip to all who are present at the house when they enter. It is polite to accept this offering. Because of the Great Fire there are very few people who openly follow fire spirit practices. It is rare for a person to become Spirit Bound to a fire spirit in the Holthar region. If a person is Bound to a Fire Spirit or openly practices fire rituals, they will be avoided and mistrusted. The inhabitants of Holthar celebrate celestial events including the Winter and Summer Solstice and the Autumn and Spring Equinox. Some of the smaller and more rural areas celebrate the phases of the moon. This is especially prevalent in the coastal regions as the moon affects tides. The full moon is usually celebrated with a feast with as many family members and local friends as can gather. In some places the feast lasts for three days, but in others it is only one larger than normal dinner. On the new moon, a day, or three, of fasting is observed. Daily life in Holthar is similar from city to towns to farmland and countryside. Most of the populace works and has enjoyed prosperity since the Unification of Sobukand. Education is important and most children go to school throughout the year except during times when they are needed to help their home or community (planting, foaling, harvest, etc.). If children show an aptitude for reading, writing, and rituals, they attend one of the universities. Since the Empire was formed, life has been pretty peaceful in the North. In Holthar, when a child is born, the immediate family is left alone for a week with the new infant. The people believe that this is an important bonding time for the family. After a week, the child is brought out and introduced to the extended family and friends. This is often accompanied by a celebration. When a person dies, they are taken to the home of the immediate family. Here the family spends a day grieving and saying goodbyes. Then, the next day, the extended family and friends are invited to say farewell. The parting ritual is performed and the Ancestor is invited to separate from the body and move to the Ancestral Spirit world. After this the body is buried near the family home. If the ground is too rocky, a cairn is built over the body. Games that are popular are card and dice games; really anything that is small and portable. King’s Men (chess) is common in the cities. As far as sports go, climbing competitions are popular, both in and out of the forest; rock climbing for the less forested areas. Swimming is also popular, especially along the rivers.